If you’ve ever been to a White Center/South Delridge Community Safety Coalition meeting, you know that’s Kathy Kaminski, one of the WCSDCSC’s energetic co-facilitators (along with Karen Greene). 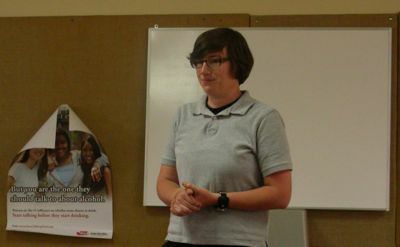 At the end of Thursday night’s meeting, Kathy had a personal announcement: Next meeting will be her last, as she is leaving Seattle Neighborhood Group in July to return to school, seeking a Master’s Degree in Public Administration. She says she hopes to return after her two years of studies; she’s been with SNG for five years (per its staff page). In my years in White Center, I can say that Kathy Kaminski was perhaps the most responsive, competent and able member of the Seattle Neighborhood Group. When Deputy Steve Cox was alive and cleaning up White Center, they were a force of nature. She will be sorely missed. A great big thanks to Kathy Kaminski. « Help out with White Center’s new playground!